Volunteers for the Washington State Traffic Safety Commission peered inside 27,638 cars in 23 counties across the state and recorded which drivers were distracted for a variety of reasons, such as using cellphones, eating or fiddling with the radio. Sure, it’s frustrating to be stuck at a green light because the driver in front of you is not paying attention. But the delay — whether due to someone texting, changing the radio station, or simply being lost in thought — may not occur as often as you think. An observational survey released this week found that the estimated rate of distracted driving statewide has decreased slightly over the past three years. The new study found about 8.2 percent of drivers distracted while the car was moving, a 1 percentage point drop from studies conducted in 2016 and 2017. 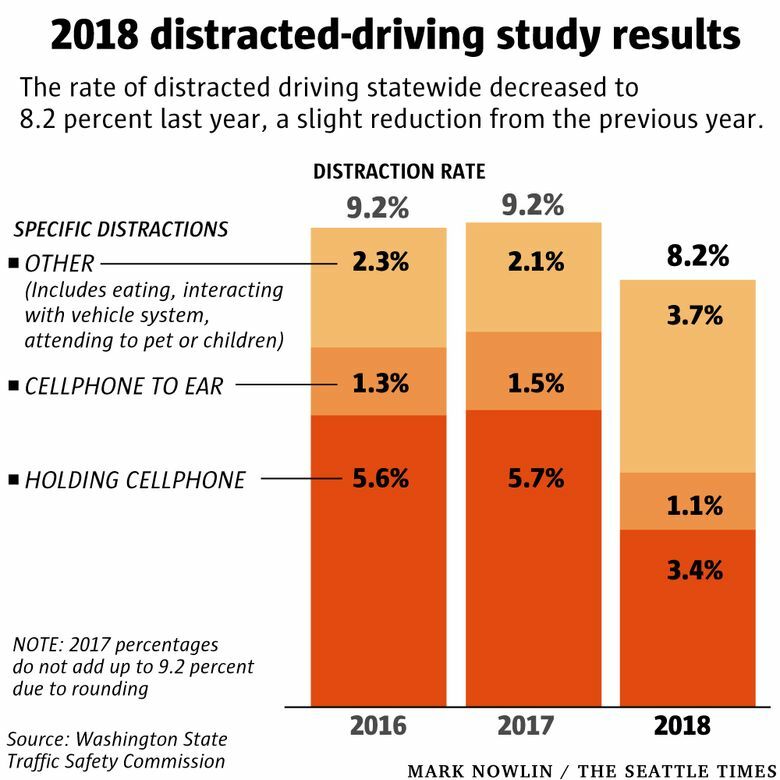 To complete the study, volunteers for the Washington State Traffic Safety Commission peered inside 27,638 cars in 23 counties across the state and recorded which drivers were distracted for a variety of reasons, such as using cellphones, eating or fiddling with the radio. The state Driving Under the Influence of Electronics Act forbids the use of electronic gadgets such as phones, tablets, laptop computers and personal gaming devices while behind the wheel — including at a stop sign or red-light signal. The law went into effect in July 2017, and full enforcement began last January. A fine on the first offense is $136 and increases to $234 for a second offense within five years. 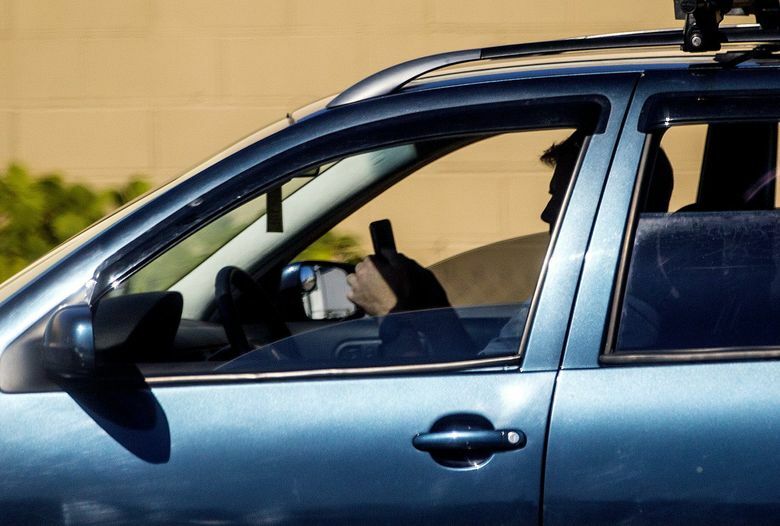 The percentage of drivers that volunteers saw holding a cellphone to their ear or in their hands, illegal under the state law, dropped to 3.4 percent last year from under 6 percent in both 2016 and 2017. However, the survey found other types of distracted behavior, such as eating, tuning a radio, or attending to pets or children, rose. In both 2016 and 2017, just over 2 percent of drivers were distracted by those kinds of activities. Last year, 3.7 percent of drivers were influenced by distractions not involving electronics. While cellphone use by drivers appears to be down, “the increase in the frequency of other distracting behaviors is concerning,” according to the report. Drivers also fidgeted with their phones and other gadgets while stopped at traffic lights less in 2018. The rate, which was counted separately than distractions when a car was moving, dropped to 8.4 percent from 17.4 percent in 2017. Part of the reduction may be attributed to law enforcement, Hoff said. The Washington State Patrol issued 31,160 tickets to distracted drivers between last January, when the grace period ended, and the end of November. From August to December 2017, officers handed out an average of 1,300 tickets per month. The monthly average about doubled after last January. Kitsap County saw the biggest decrease in distracted driving observed in the survey, from 20.5 percent in 2016 to 4 percent last year. In King County, distracted-driving rates decreased from 9.7 to 7 percent during that same time period. The distracted driving rate in Cowlitz and Spokane counties increased to more than 11 percent. Hoff cautioned about putting too much stock in county results, as the sample sizes can vary widely. Volunteers conducted the survey at intersections in 23 Washington counties. Of the 300 sample sites, 47 were in King County. Each intersection was staffed by a two-person team consisting of an observer and recorder. The observer looked inside approaching cars to see any distracted behavior, relaying what they saw to the recorder, who entered it into data fields. The study has limitations. For example, some people may change their behavior if they notice they are being watched. And the study didn’t capture the number of drivers engaged in multiple distractions at the same time, Hoff said. The Traffic Safety Commission this year plans to observed distraction among drivers on highways and freeways, in addition to intersections. 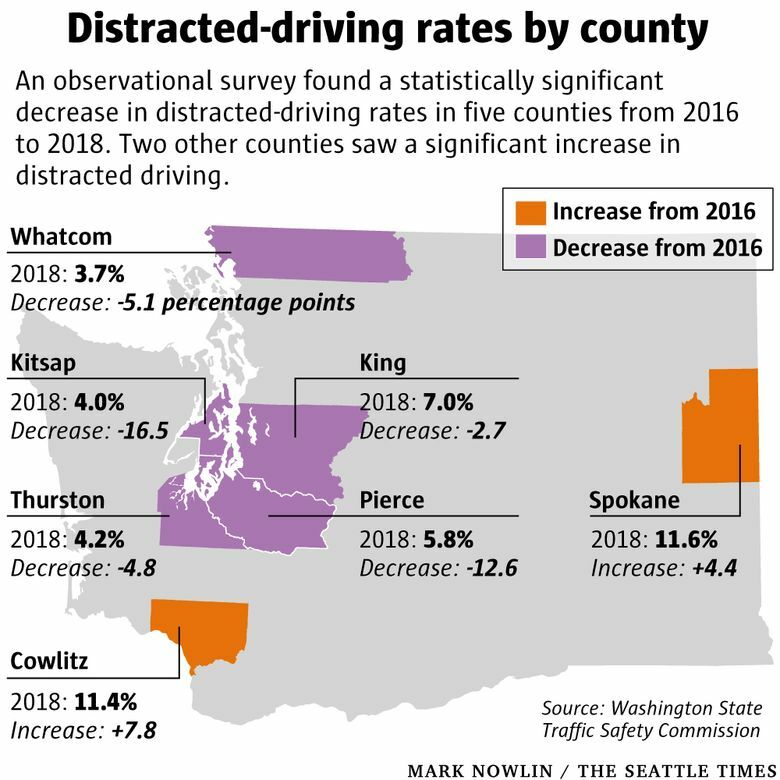 Hoff hopes to better identify and reduce other types of non-cellphone distractions, and understand why some counties like Kitsap have seen such a drop in distraction rates.